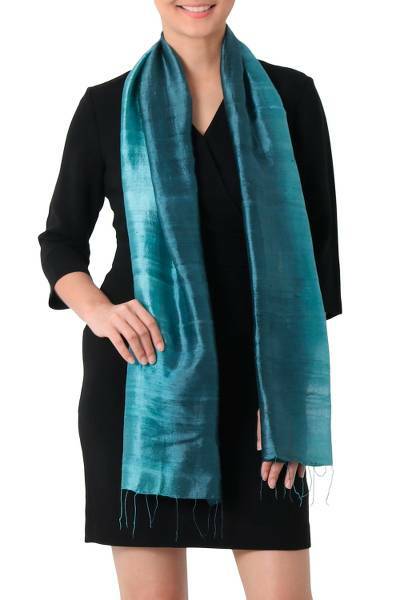 Artisan Crafted 100% Silk Teal Wrap Scarf from Thailand, "Peacock Blue"
You can find silk scarf 'Peacock Blue' by Vinita in accessories categories such as Hand Woven Scarves, Silk Scarves and Wrap Scarves. Enjoy exploring these sections for other Novica treasures. The photo does not do the Peacock Blue scarf justice. It is a beautiful color and lightweight and adds some class to every summer dress. Amazing value for the price. Beautiful and great quality! Just what I expected! Lovely lightweight scarf! This versatile scarf works from summer to winter. Perfect when my outfit needs a little pizzaz! The silk is soft and light. The color is vibrant. Perfect length for wrapping around the neck or hanging long down the front. I ordered this scarf from the artist Vinita and it was so lovely that I was inspired to also order her shimmering crimson scarf. This soft delicate silk is dyed the most intense shade of peacock blue. Absolutely lovely! I gave this to my mother as a Christmas gift. She loved the material - especially its vibrant blue color! I sent this to y daughterinlaw for her birthday. She loved the colors and was thrilled to receive it. So was my 8 year old grandaughter who was the first to model it. It is very lovely..
Scrumptious fabric which is dyed well and beautifully made into scarf to accompany any outfit.